During my usual morning consultation of my email and internet subscriptions, I came across a new video by ERP. In this latest showdown, which is once again pop-culture gold, we get cable TVs most popular fathers – Rick Grimes of The Walking Dead and Walter White of Breaking Bad. 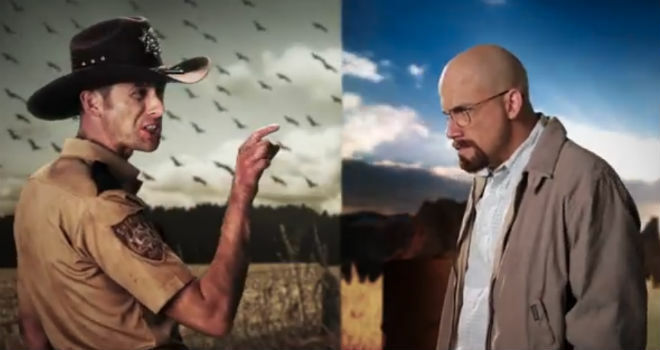 What better way to generate comedy than to match up a post-apocalyptic dad who was forced to kill his wife’s reanimated corpse, and a chemist who began cooking meth to ensure his family’s future and then became a ruthless kingpin? And as usual, Nice Peter and EpicLLOYD are just awesome in their roles! Seriously, they just BECOME whoever they’re imitating. Enjoy!